Amber passed away Thursday, September 6, 2018 at Bronson Hospital in Kalamazoo. She was born September 15, 1997 the daughter of Donnie and Carla (Burton) Hedges. 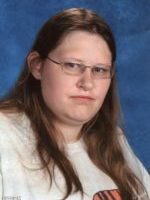 Amber was a 2016 Allegan High School graduate and was currently attending Hillside Young Adult Campus. She had volunteered at many local businesses including, Save-A-Lot, My Best Friend’s Inn and Hillside West Cafeteria. Amber enjoyed participating in the Special Olympics in bowling, swimming and T-ball. She liked fishing and woodworking. She had made many wooden signs for businesses in the area including Aubrey’s Closet. Amber was a very kind and loving girl who always had a smile on her face. She will be greatly missed by her family, teachers, classmates and friends. Surviving are her parents and brother, William Hedges of Allegan. She was preceded in death by her infant sister, Cindy Hedges in 1993. A memorial service will be held at 12 noon, Friday, September 14, 2018, at the Winkel Funeral Home, Otsego, with Celebrant, Bill Rose officiating. In lieu of flowers contributions in memory of Amber may be made to her family to help with expenses. I had known Amber since I was a baby.. I’m 17 years old currently. Her mother is my mother’s best friend, so I have known Amber for a long time. I haven’t seen her in a few months, so I feel terrible.. She was beautiful and she was such a sweetheart.. she always smiled and made jokes that made me laugh. I will miss her dearly. Such a sweet, sweet girl. Amber will surely be missed.